Weight at Rescue: 11 lbs. Kshama was 7 weeks old the first time we saw her. 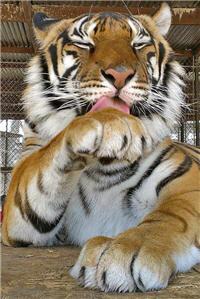 An In-Sync volunteer saw a For Sale ad in the Dallas Morning News for a female tiger cub. The seller bought her from a breeder, only to realize later he could not keep her. After checking to see if we would have room for another cat, the volunteer spent several days trying to convince the seller to donate the cub to In-Sync but was unsuccessful. 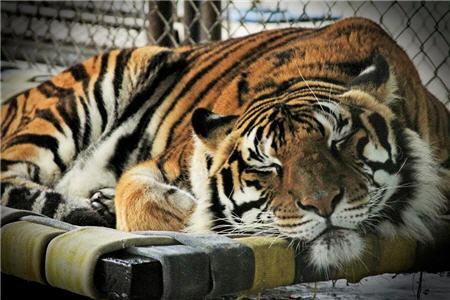 Knowing what kind of life this tiger could have if she wound up in the wrong hands, the volunteer decided to purchase Kshama and donate her to In-Sync, guaranteeing her a good life. The seller would not give his name or location, only directions to a remote road somewhere near Texarkana for us to pick her up. Kshama was about 10 lbs underweight when we got her. She had coccidian, an intestinal worm, and a few scrapes on her nose and head indicating she was being kept in a very small enclosure. 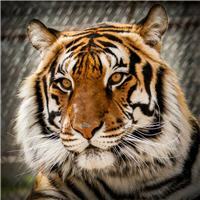 Kshama is now a full-grown, healthy, beautiful tiger. She loves playing with her toys, and will run around excitedly whenever she gets a new one. Her favorite game is Hide and Seek, especially if there is a tub of water around. She will crouch down low, peering over the tub, and when you least expect it…or even if you do…she’ll jump in her tub and splash anyone who’s around. She makes herself very visible for visitors as she loves to be told how pretty she is.